Sam and Ben are twins. They once shared the same scrunched up space in their mommy's belly and they share the same birthdate. That's where the similarities end. They have different hair color and texture. They have different eye colors. They have different interests. Sam and Ben are twins, but they are also individuals. 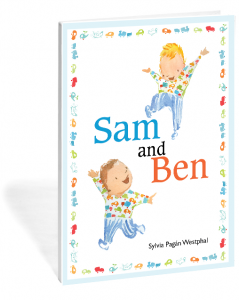 The story of Sam and Ben is a great introduction to the concept of twins. It does explain that twins are the same age, have the same family, and the same birthdate. It also offers examples of ways twins can be different: in looks, in interests, in personalities. This book also included a mulitcultural element to the story. In this book, Sam and Ben have a Oma (representing their German heritage) and an Abuela (representing their Hispanic heritage). Including a variety of cultures in my children's book choices is important to me. The book is a portrait of a unique family with many cultural influences that come together and form two beautifully unique twin boys. This book would probably work best for older preschool through grade 2. My three year old seemed just a little young for this book. There were so many concepts that were new to Logan. He has never experienced twins. Also, the words Oma and Abuela were new to him. The author also included words like Ah-bah, Ah-tan, and Tah-tan for the babies' siblings. Even I was confused as if those words were from another language or if they were just nicknames that babies had given their brothers and sisters. We reviewed this book as an ebook which is always engaging for Logan! It's a very simple look with clean white pages and bright colors. This book doesn't have any interactive features in the ebook. I actually enjoyed that in a sense. Sometimes I get tired of ALL the bells and whistles that are literally on every page of some children's ebooks. It seems this story is as old as time, we also read the biblical account of Jacob and Esau last week. Jacob and Esau were twins. Although they shared the same birthdate, that seems to be where the similarities ended. They didn't look alike. They had different interests. This story was a struggle for Logan because he has not experienced twins. However, the book Sam and Ben allowed him to draw from some background knowledge and understand the story better. 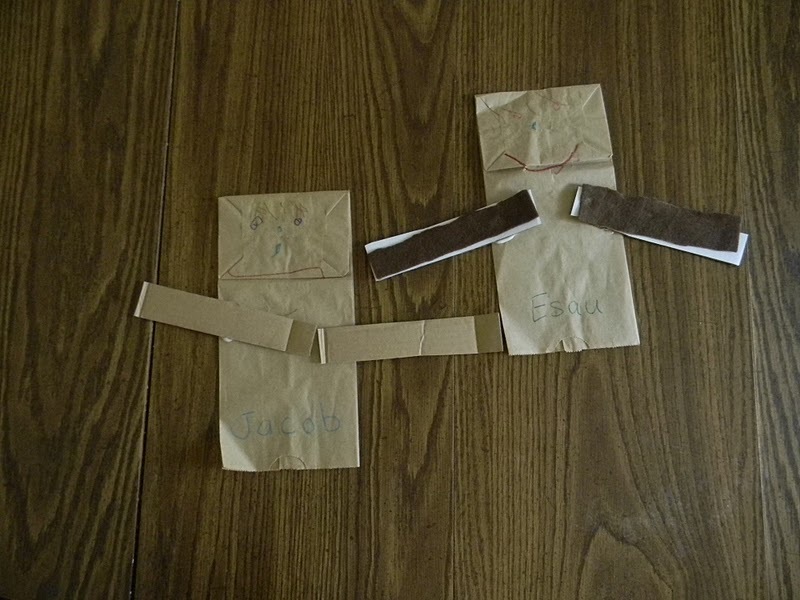 We also made these Jacob and Esau puppets. I asked Logan if he wanted to make Jacob and Esau or Sam and Ben. He picked Jake and E. We talked about differences in eye color, hair color, skin color and texture. It was another great opportunity to talk about ways that God created us and loves us in unique ways. Disclosure: I was sent a free ebook from the publisher in exchange for my honest review of the book. What a great way to tie learning to this story. We need to try music during quie time.